Only a crisis — actual or perceived — produces real change. When the crisis occurs, the actions that are taken depend on the ideas that are lying around. That, I believe, is our basic function: to develop alternatives to existing policies, and to keep them alive and available until the politically impossible becomes politically inevitable. Heavy fighting started again on July 28, 2011 in Mogadishu, the capital of what was once Somalia, in a battle between the African Union peacekeeping force (Amisom) and the Islamic insurgency al-Shahab. The fighting prevents aid from reaching the tens of thousands of refugees who have arrived in Mogadishu fleeing famine. The United Nations (UN) World Food Program says it cannot reach some two million people in need in areas controlled by al-Shahab which had expelled Western nongovernmental organizations (NGOs) who were providing relief. The Horn of Africa, in particular Ethiopia, Somalia and Kenya, faces a deep crisis, a combination of refugee flows, famine in part linked to drought, and persistent conflicts. There is a broad consensus in the UN system that radical measures are needed to deal with the Horn of Africa crisis and that these measures will have to be taken in a holistic way with actions going from the local level of the individual farmer to the national level with new government policies, to measures to be undertaken by the African Union and the UN system, in particular the Food and Agriculture Organization (FAO) in Rome. 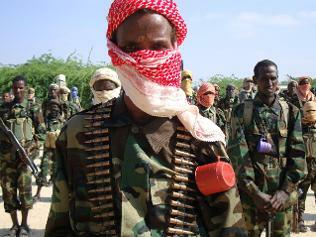 Combatants with Somalia's al-Shabab Islamist militia. Today, cooperation is needed among the UN family of agencies, national governments, NGOs, and the millions of food producers. There is a need for swift, short-term measures to help people now suffering from lack of food, inadequate distribution and situations of violence. Such short-term action requires additional funding for the UN World Food Program and the release of national food stocks. However, it is the longer-range and structural issues on which world citizens have focused their attention. The world requires a World Food Policy and a clear Plan of Action. While constant improvements in technology, mechanization, plant breeding and farm chemicals have steadily increased food production per acre in much of the world, African food production per acre has stagnated, and in some areas has gone down. Likewise, the portion of development assistance in Africa dedicated to agriculture has declined from 15 per cent in the 1980s to 4 per cent in 2006. 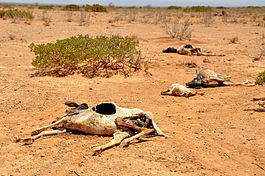 Carcasses of dead sheep and goats in the drought-stricken region of Waridaad, Somaliland. Thus, the first need in Africa is to develop the local economies: currently, poverty, lack of adapted technology, population pressure on ecologically fragile areas, a growth of urban slums due to rapid rural to urban migration is the lot of many Sub-Saharan African countries. The Horn of Africa is an extreme case. The Horn possesses all the resources needed to make it one of Africa’s major economic centers, and yet there seems to be no halting the environmental decay and political insecurity it engenders. In fact, when one looks at the Horn’s problems, one must conclude that urgent and well-directed international action is needed to prevent a mega-disaster. Due to an often unenlightened management of the environment, its willful mismanagement to extract short-term economic gain, and confrontational rather than conciliatory policies, the squandering of the region’s resources has gathered speed. 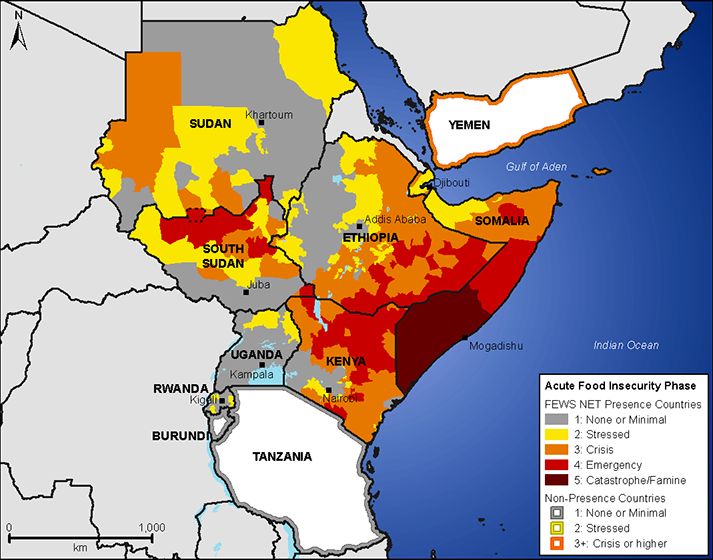 A map of the ongoing famine in the Horn of Africa. The facts speak for themselves. Environmental degradation is part of a cycle that upsets the traditional balance between people, their habitat and the socio-economic systems by which they live. Insecurity leads to strife; strife results in inter-clan feuding, civil war, cross-border raiding and military confrontation. Environmental degradation and insecurity continue to interact, swinging back and forth like a pendulum of destruction. A shrinking resource base breeds insecurity; insecurity spreads conflict, and conflict causes environmental destruction. It is hard to know how to improve the situation. There is a long-term need for people to modify their living patterns to bring about a better quality of life, with increased security. There is a need to break the cycle of chaos so that people can transform insecurity into confidence. Yet social change is slow, and the necessary limiting of the birth rate can take generations. Agricultural patterns also change slowly. There is no political leadership within the area, and there is no cooperation among the states of the Horn. The African Union’s conflict management structures do not function, and the UN has hoped that the African Union could take the lead in the area’s conflict resolution. This was a hope based on an unwillingness to get involved rather than a realistic evaluation of the situation. The cycle of chaos is likely to speed up, and more refugees will be on the move. However, as Milton Friedman noted only a crisis produces real change. Just as the “Arab Spring” brought a new generation of leadership into action — though not yet into power — the Horn of Africa might see a new generation of non-governmental leadership coming to the fore. The older political and clanic leadership has failed and is discredited. However, they have guns and plan to stay in control. Yet what is politically impossible today in the Horn may become politically inevitable.